Starting on Monday with the resumption of classes. 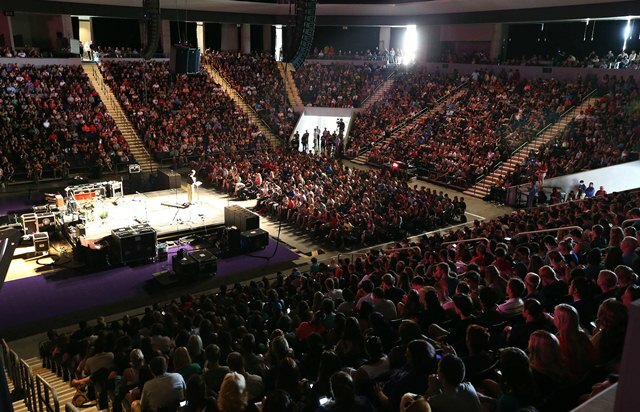 Grand Canyon University students, faculty and staff will have the opportunity to continue to hear how God interlaces His plan through individual lives at Chapel in the Arena. Chapel will continue the fall theme of “His Story, Your Story,” which weaves personal testimonies of Christian pastors and speakers from around the country with the stories of biblical figures. The list of speakers for the spring includes a pair of pastors from East Valley churches, a Christian recording artist and the executive director of Tyndale House Cambridge, an independent biblical studies library. Chapel services will end in mid-March because of the start of construction to expand the Arena. The final service of the spring will be held March 10. TheGathering, student-oriented worship services held at 8 p.m. Tuesdays in Antelope Gym, will continue through the end of the school year. Chapel services begin at 11:15 a.m. on Mondays (except for holidays) in the Arena. The style of the series will remain much the same as the fall, with slide-style announcements playing on the Arena message boards at 11:15 and the Chapel band starting worship thereafter. Dean of Students Pastor Tim Griffin said the band will emphasize student-led worship but that the music will remain a dynamic experience. Griffin, who will speak at the final Chapel of the school year, made an emphasis to recruit pastors from East Valley churches to speak at Chapel as the University prepares for the opening of its Mesa satellite campus in the fall of 2015. Griffin said he wanted to introduce churches in cities such as Gilbert, Mesa and Chandler to Chapel and encourage pastors to speak at Chapel services in Mesa the next year. Scott Ridout, lead pastor of Sun Valley Community Church in Gilbert, and Lead Pastor Mark Connelly of Mission Church, also in Gilbert, are two of the East Valley pastors who will speak this spring. Other notable speakers include Peter Williams, executive director of Tyndale House Cambridge, and Christian recording artist Amanda Noelle.